Experience a superior, more simplified way to manage your fleet. 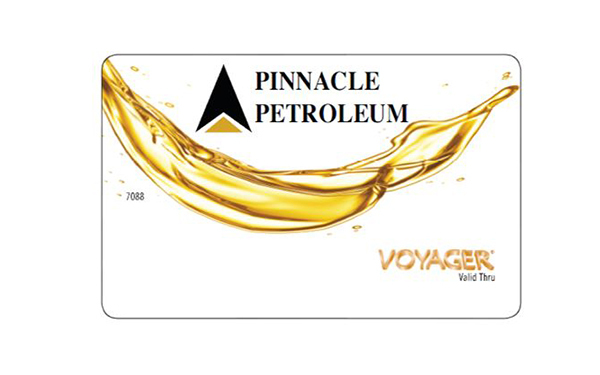 The Pinnacle Petroleum Voyager card is a single-card solution that runs on a secure, reliable and proprietary network. Companies in all industries rely on us to help their fleets operate more efficiently through reduced expenses, increased control and enhanced visibility. One card equips you with the information and tools you need to improve business decisions, gain oversight and give your business a competitive edge. 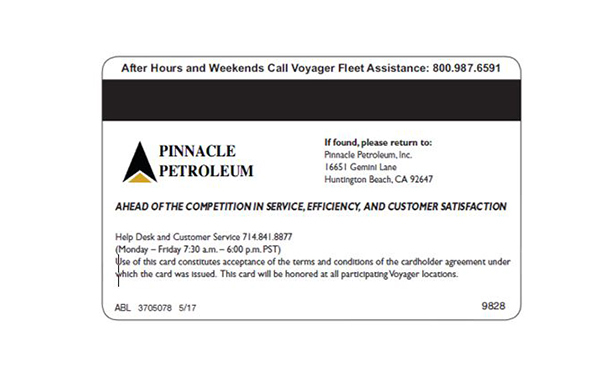 A single card for your fleet. Utilize one solution to increase visibility over your entire fleet, from cars to light-duty trucks to over-the-road rigs. Nationwide acceptance. Drivers can experience seamless transactions at more than 320,000 retail and private fueling sites, truck stops, maintenance providers and service locations. Industry-leading reporting tools. Complete level III fleet data provides line-item insight into every purchase, including non-financial transactions at private fueling sites. U.S. Bank Fleet Commander® Online. Track, update, and manage all fleet operations and payments. Capabilities include robust reporting tools, real-time account maintenance, controls and alerts to stay informed and in control of expenses. Direct data integration. Support existing business processes with seamless integration into your existing financial, telematics and fleet systems for a comprehensive view of operations. We also have a partnership with an established GPS INSIGHT company to offer all GPS capabilities. Purchase control. 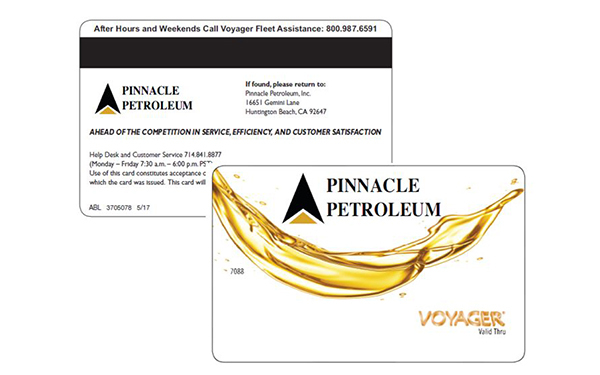 Leverage robust controls including PIN, odometer, vehicle/ driver ID and customizable fuel pump prompts to reduce fraud and prevent misuse. Optimized routes and fueling. The Voyager® Mobile App allows drivers to pinpoint the most efficient fueling locations with real-time information on current prices and available routes. Merchant discounts. This feature allows fuel providers to accommodate negotiated discounts—including cash price or reprice at truck stops. Unrivaled customer service. Available 24 hours a day, whether you’re in the office or on the road. We don’t rest on our laurels. We have Oklahoma roots and a midwestern work ethic: industriousness, personal accountability, and integrity. A talented team with combined 125 years of fuel delivery experience. This combined experience, along with an unyielding dedication to our clients, allows us the ability to offer a best in class fuel program.